Manure applied on frozen soil or snow - what will happen to my nitrogen? It was a tough fall for manure application. In many places of the state it was wet and harvest was delayed. On top of that, winter arrived earlier than it has in the past couple of years. Many people were forced to apply manure on top of frozen soils or even snow. We’ve gotten a lot of questions about how the nitrogen in the manure will be impacted. 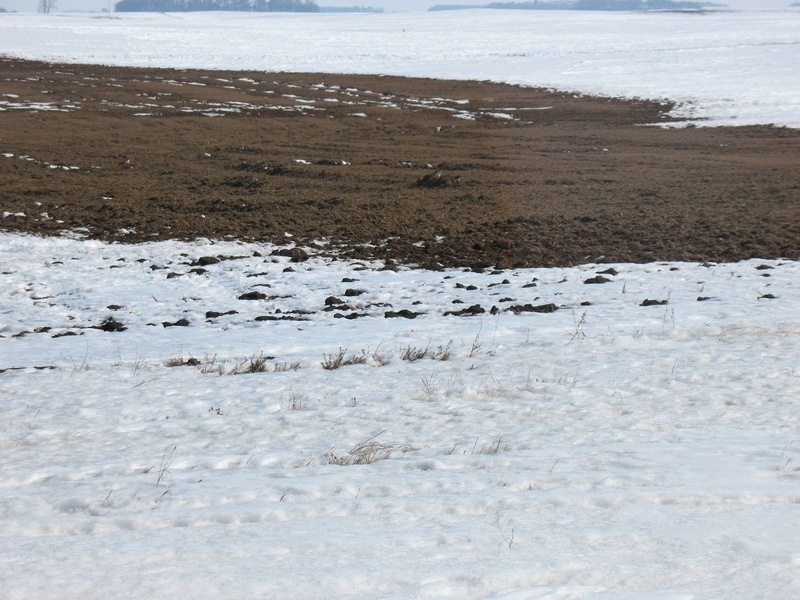 When manure is applied on the surface of frozen soils or on top of snow, we have two concerns. First, it cannot seep into the ground, so if there is any runoff in your fields, it can carry the manure to low spots or away from the field entirely which may cause environmental issues. We have already seen widespread rain in December across southern Minnesota and snow melt in January in many parts of the state. Fields with higher amounts of residue are less likely to have as much runoff as fields with low residue, so this problem may be worse in some fields and not others. The second problem we have to consider is the ammonia losses. Remember that manure has two main forms of nitrogen: organic-nitrogen and ammonium-nitrogen. When ammonium-nitrogen is on the soil surface instead of being mixed in with the soil, it can volatilize and be lost as ammonia gas. This is mainly driven by chemical and physical factors. While the freezing temperatures slow the reaction down, research suggests it doesn’t stop it entirely. 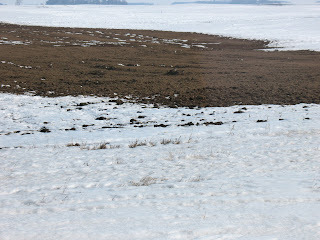 Plus, with the freeze thaw cycles we have seen this year, it is difficult to pinpoint how much will be lost as the manure sitting on the surface freezes and thaws, too. This problem is likely to impact all manure types, but especially swine manure since the total nitrogen content is roughly 60 to 80 percent ammonium-nitrogen when applied. Unfortunately, we cannot predict exactly how much nitrogen was lost this year if it was applied on frozen soil or snow. Manure nutrient release can vary depending on specific circumstances. Our best guess is to use our guidelines in Table 1. This will help determine the percent of nitrogen available the first year when broadcasting manure with no incorporation (see the second column). The actual amount available may be more or less, however. My best advice is to keep an eye on your crop this upcoming year and be prepared to sidedress additional nitrogen if the crop is looking deficient. The Minnesota Pollution Control Agency says you can apply an additional 20 percent of total crop N needs above UMN nitrogen guidelines (PDF) if soil conditions or cool weather warrants additional nitrogen application. Table 1. Nitrogen availability and loss as affected by method of manure application and animal type.